Esquire and Highcastle Homes, trusted names in building exceptional homes in beautiful communities. Two, established industry leaders who together have committed to the bringing their clients the best in quality and service when it comes to new homes. 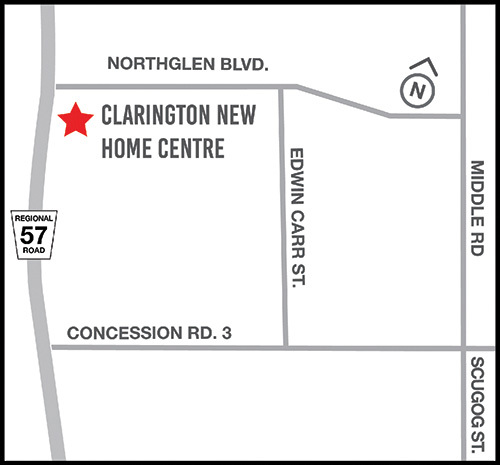 "Yes, I would like to join the Clarington New Homes mailing list and provide my consent* "
Purchasing a New Home with Ease! Step into our newly designed sales centre and enjoy a fresh cup of coffee while our team of experienced professionals guide you with ease along the journey of making your dream home in Clarington a reality. Illustration is concept by the artist. Prices and specification are subject to change without notice. E. & O.E.